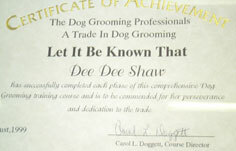 My name is Dee Dee Shaw, an experienced toy and small dog groomer. 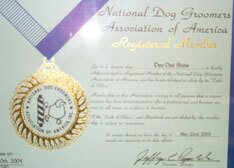 In addition to pet grooming, my husband Terry and I breed and show Shih Tzu. We have been in the dog world for the past fifteen years. This has given me the opportunity to watch all the small dogs - how they should look and how they should be groomed. I have studied the art of grooming and am a certified Professional Dog Groomer and a member of the National Dog Groomers Association. 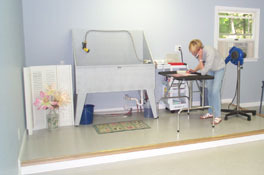 Hopefully, I will be able to assist you and your pet at my shop in the near future. In the meantime, please browse my web site. Please feel free to call or e-mail me with any questions.